Because de-stressing doesn’t have to mean spending too much time or money! 1. Get some peace and quiet. There's nothing like some peace and quiet after a very hectic day. Find a serene spot to clear your mind and de-stress for a good 10 minutes. If going online after a long day is your idea of rewarding yourself, you'd be surprised at how much more of a treat going offline is—it's like unsubscribing from the drama, hate, and negativity of the world. Never underestimate the power of a good hug. A big, tight embrace will feel as if you're unloading your burden to a friend without literally doing so. It's comforting and best of all, it's free! Nothing beats the relief that breathing exercises can bring. 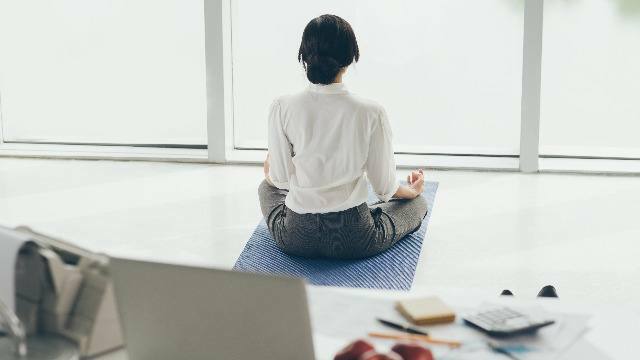 Look for a calm corner in your office or at home and simmer down by doing the 4-7-8 breathing exercise. Inhale for four counts, hold your breath for seven counts, and exhale for eight counts. You know you've had a rough day at work when your desk looks like a warzone. Tidy it up and return everything to its proper place. This will not only result in an aesthetically pleasing work area, but also a calmer and more relaxed you. 6. Take a nice, warm bath. Contrary to what most people think, taking a long shower isn't the only way to relieve stress. You can take a short bath and feel refreshed and rejuvenated just the same if you use a pampering body wash. Dove Body Wash gently cleanses and gives your skin the pampering moisture it needs. Just one drop of Dove Body Wash onto a cleansing puff or loofah will give you a marshmallow-like lather, which you can use to pamper and massage onto your skin. You will step out of the shower with skin that feels smooth and bouncy. Just remember these three simple keywords when you take a shower: Pour. Puff. Pamper. 7. Go for a walk. Getting up and going for a walk is already helpful in keeping stress levels to a minimum. According to studies, greenery can give a calming influence and help improve attention span and memory span. There are usually a lot of things going through our minds when we're stressed and it can be quite overwhelming to keep thinking of everything that needs to be done. To silence those thoughts and worries, close your eyes, focus on your breathing, and rid yourself of all your worries. Whether you hit up a funny friend or watch hilarious clips online, having a hearty laugh is guaranteed to lighten your load, both mentally and emotionally. Looking back at old memories, relay a funny incident, or talk about anything under the sun. Ten minutes of catching up with a friend can help relieve any forms of stress.